These Vegan Lemon Muffins are great to bake for a weekend breakfast. 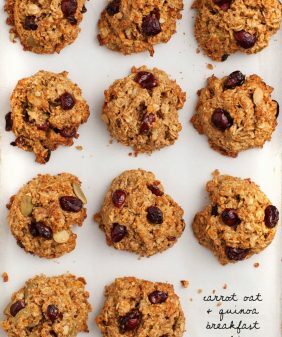 Freeze extras for busy mornings or quick snacks! This post is in partnership with ALDI. Happy New Year! I hope you all had a fantastic celebration. Us? Well, we had a nice dinner and then slept through the new year for (I think) the second year in a row. The thing is – I’ve become a morning person. It wasn’t intentional – it just happened. On weekdays, I find that I get my best work done first thing in the morning. On weekends and holidays, I like to get up, pour coffee, and bake something for breakfast. So here are some yummy lemon muffins that I’ve been baking lately! 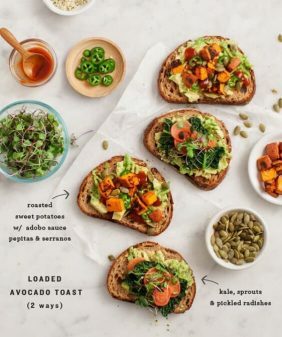 This post is in partnership with ALDI, because I wanted to tell you about some new exciting healthy/veggie-forward products that they have like Meyer lemons(! ), organic coconut sugar(! ), and even vegan cream cheese, which I used to make a simple frosting for my muffins. I love Meyer lemons because they’re juicier and sweeter than other lemons. They’re sometimes hard to find but, conveniently, they’re at ALDI. Did I mention that these lemon muffins are vegan? There’s no need for an egg here – they rise perfectly without one. I used almond milk, apple cider vinegar, and olive oil in lieu of any dairy. I especially love using olive oil in lemon recipes because lemon and olive oil are a great flavor pairing. Coconut sugar makes these refined sugar free. 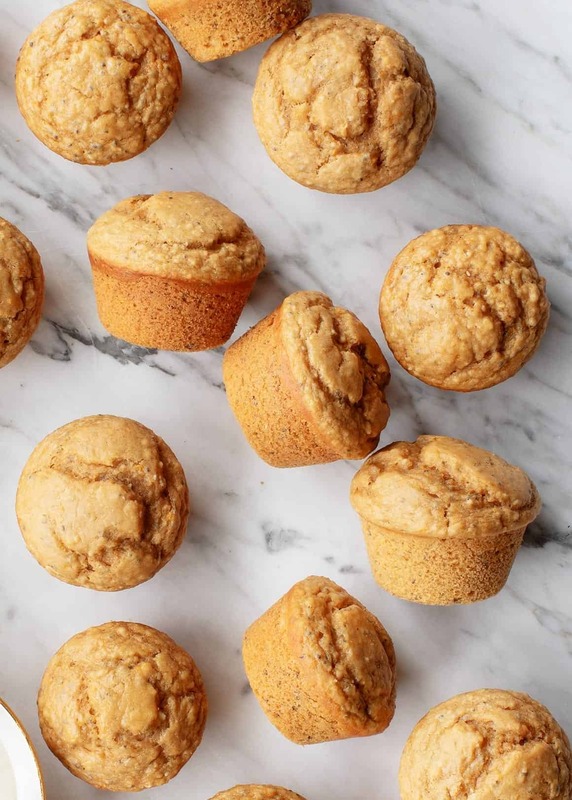 These lemon muffins are made with some almond flour, which gives them a nutty texture and flavor. Pro tip: you don’t have to buy almond flour, you can just blend slivered almonds in blender until they become a fine meal. Instead of making lemon poppy seed muffins, I used chia seeds. You get that same look and a tiny bit of crunch, but chia seeds also add some extra nutritional value, so I love using them here. 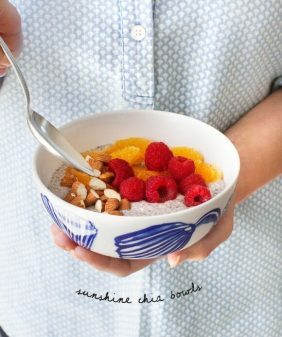 Plus, chia seeds are a more common pantry staple for me; I always have them on hand. The frosting here is light and lemony – it’s made with vegan cream cheese, maple syrup, Meyer lemon juice, and lemon zest. The muffins themselves have a lighter lemon flavor, but the frosting and the zest on top make them bright and tangy. Like all muffins, these are best on the day they’re made. They freeze well, and the frosting can be stored in the fridge for a few days (it’s best to freeze them un-frosted). Find these ingredients and more fresh and affordable healthy finds at ALDI. 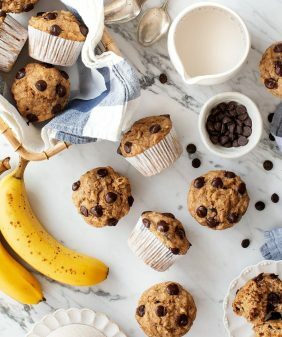 And if you’re as much of a muffin fan as I am, I heartily recommend you try these Vegan Chocolate Chip Banana Muffins and these Coconut Mango Muffins next. 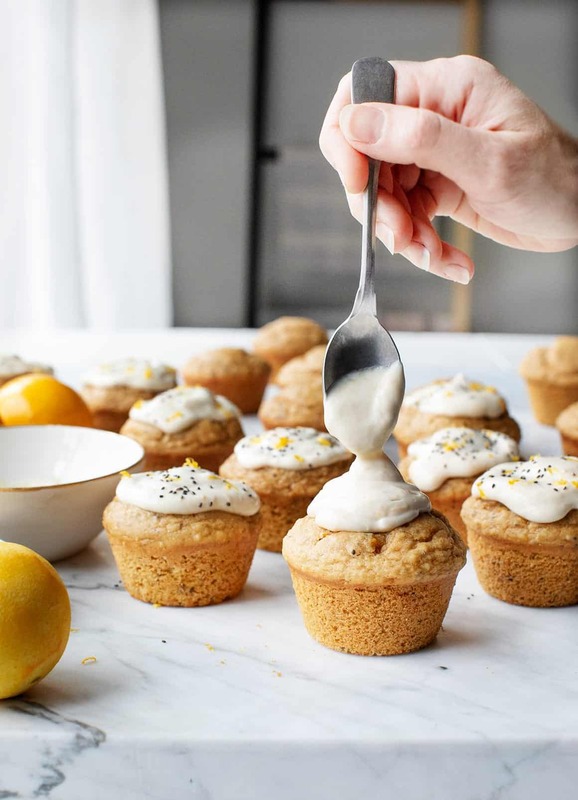 These vegan lemon muffins have a light lemon flavor and crunch from chia seeds. Top with the cream cheese frosting for an extra-zesty, lemony pop! Preheat the oven to 375°F and lightly oil a 12-cup non-stick muffin tin. In a small bowl, combine the almond milk and apple cider vinegar. Set aside. In a large bowl, whisk together the flours, baking powder, baking soda, and salt. In a medium bowl, whisk together the sugar, olive oil, lemon zest, lemon juice, and vanilla. Stir in the almond milk mixture. Combine the wet ingredients with the dry ingredients and mix until just combined. Fold in the chia seeds and use a ⅓-cup measuring cup to scoop the batter into the muffin tins. Bake for 16 to 17 minutes, or until a toothpick inserted in the middle comes out clean. Let cool for 10 minutes in the pan, then transfer to a wire rack to finish cooling. Make the glaze. Using a hand mixer or a food processor, mix the cream cheese, lemon juice, maple syrup, and lemon zest until smooth. Dollop onto the cooled muffins and garnish with chia seeds and lemon zest. 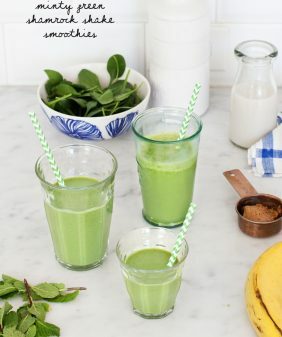 *Make your own almond flour by blending slivered almonds in a blender until they become a fine meal. Do you think I could substitute gluten free flour for the flour in it??? I use “Cup4Cup” and usually add a teaspoon of Pamela’s gum substitute to ensure cohesion. I’m thinking of trying this with a higher ratio of Almond flour with Cup 4 Cup GF flour because I want a higher protein content. Any recommendations, Jeanine? I have been making almost every recipe that comes to me from you via newsletter. I have been the “star baker” in my house ever since. Thank you for your wonderful contribution to the world of cooking and baking! Happy New Year. (I’d buy your book but am under threat of having ALL my books donated if I bring one more cookbook into the house. Perhaps you have a place to simply donate? HI Meghan, I’m so glad the recipes have been working well with Cup4Cup! You could probably try upping the almond flour ratio – they won’t rise quite as much and I’m not sure of the ratio with the gluten free flour (since I haven’t tested it). Let me know what you settle on and how it goes! I don’t have coconut sugar on hand, would brown sugar sub in well? Hi Diana, you can just sub in regular sugar! These muffins are vegan beauties! 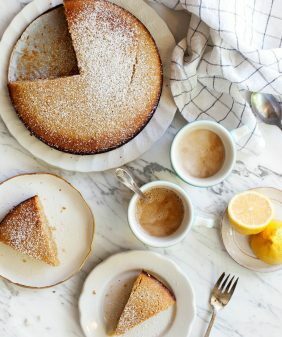 My wife made a lemon cake or lemon loaf recipe last week and they were sooo good! I know she’ll love these muffins too, thank you! Hi Bryan, I hope you both love them! Awesome!! I really like the flavor of whole wheat pastry flour. Can I sub this instead of using all-purpose? Hi Lauren, yes, I think whole wheat pastry flour would be great. Just make sure not to pack the cups too tight as you measure the flour. Hi Kristen, I’m so glad you loved them! Love the blueberry idea, yum! Your recipes are just mouth watering. In love with them. Hi Adriana, I’m so glad you loved the muffins! I actually tried this recipe and it is very good. I used regular lemons instead of Meyers and it turned out great. Super moist (even without a flax egg) and the chia seeds give a little crunch similar to poppy seeds. I will make it again.